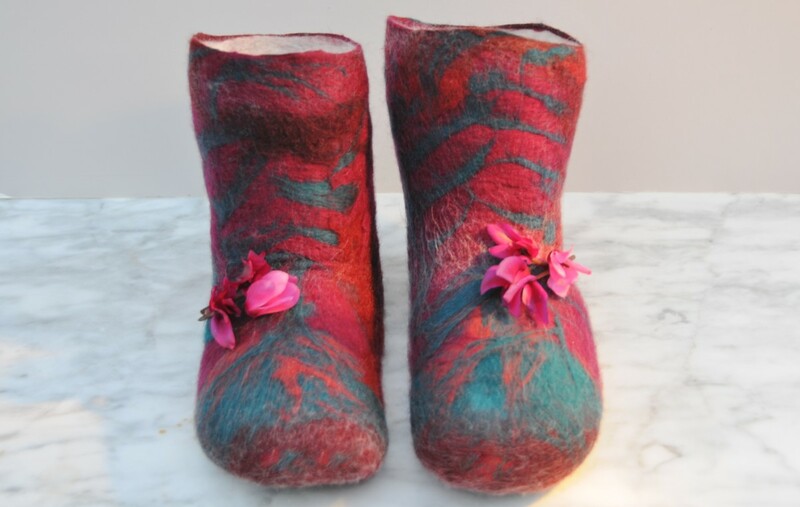 How to make these wet felted slippers. For this method, you will need a pair of transparent beach shoes. Don't worry, the shoes will not come to any harm and the wearer can continue to wear them long after you have completed this project. Borrow or buy a pair which are a size larger than those which currently fit the child or even those of an adult person who you would like to make these slippers for. In this example. I used a pair of beach shoes which I bought for £1 from a local car boot sale. Keep an eye out for bargains such as these and build yourself a supply of 'shoe lasts' in a variety of sizes. Polystyrene shoe lasts are available. but they are expensive and these work just as well. Handcrafted slippers are the perfect gift for either family and friends. The shoes I used in this example are UK size 25. They measure 6 inches long as is shown in the table below. Shrinkage on the finished slippers was minimal. The combined weight of both slippers weighed together was around 35 grams. Keep in mind that the shoes are being made on the outside of the shoe which does allow for a little shrinkage. . 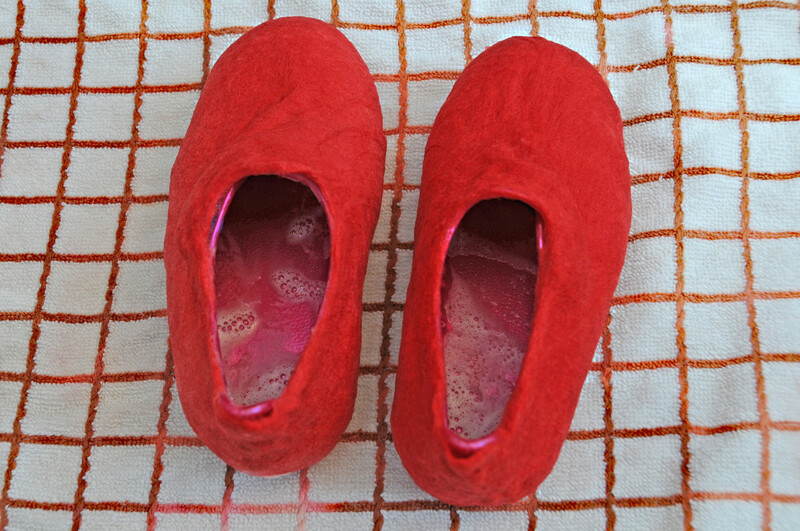 The transparent beach shoes will remain inside the project throughout the felting process. 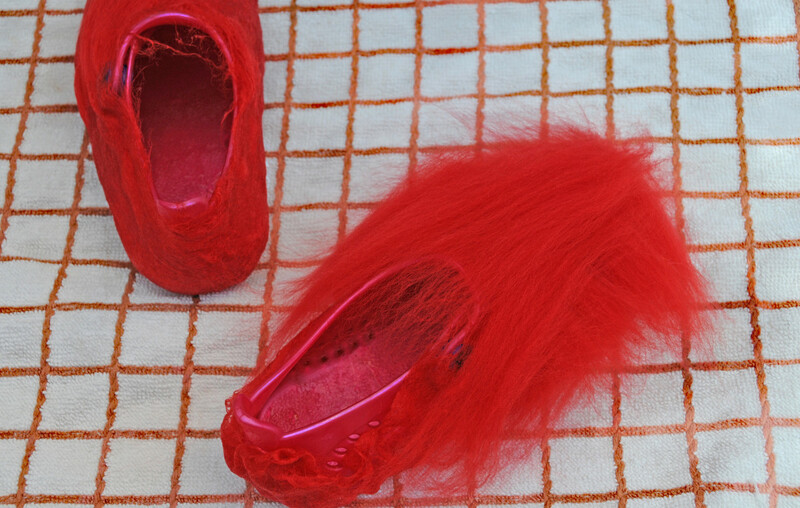 They will only be removed once the felting process has been completed. . The end result should be a perfectly formed pair of slippers which are only slightly smaller than the shoes on which they were formed. Approx 35 grams Merino wool roving. The perfect roving for beginners as it felts very easily but the finished boots will be soft enough for a small child but still keep their shape. 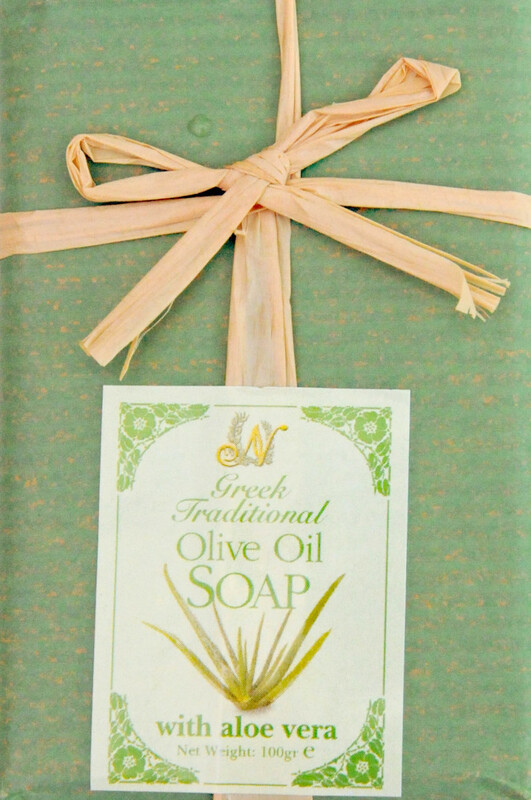 I recommend that you use olive oil soap as opposed to just plain old dishwashing liquid which I have used in the past.. It was recommended by a fellow felt maker. It is incredibly kind to the hands and to the project. It feels lovely to work with and leaves my hands feeling pampered as compared to the harsh effects of dish washing liquid. I know it is more expensive, but one uses such a small quantity during the felt making process that it is well worth the extra expense. I imagine that if wool could talk, it would tell you that it is definitely well worth the additional expense. 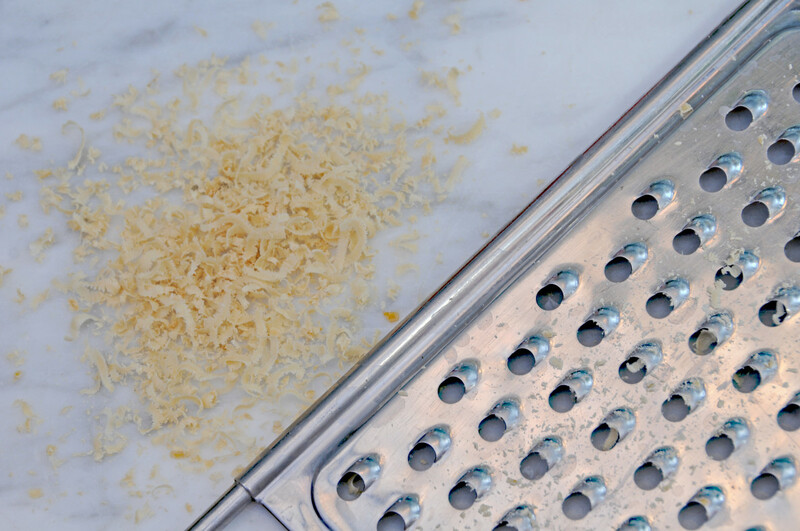 Grate a small quantity of soap and add it to a squeeze or spray bottle. Gently mix with very hot water. It will soon dissolve and be ready for use..
Place the shoes on a stand! Place the shoes on a stand of sorts.. I balanced these shoes on two small coffee mugs. Start laying out the fibers on the bottom of the shoe before moving up the front and up the sides. Later I took the shoes off the cups and inserted my hands into them. I also moved the project to the kitchen sink where I had hot and cold water readily available to me. When it comes to felting, follow your own instincts and work out a method which best suits you and produces a good end result. 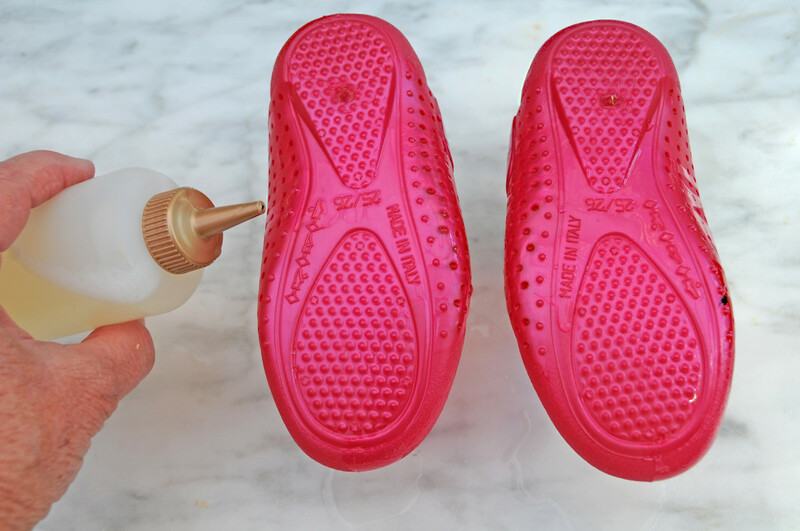 Begin by wetting the shoes with a little of the hot soapy water. It allows the fibers to adhere to the shoes. Start at the bottom of each shoe and work your way around each shoe. Keep wetting down the fibers as you work. Press them onto the shoe with your fingers or use a small folded piece of bubble wrap to do this with. Once you have covered the whole area of each shoe repeat the process twice or even three more times. The thickness of each layer will determine how many layers you will need to add to your slippers. If a thicker felt is required, add one or two more layers. Always err on the safe side, too thin is to result in failure when starting out.
. Uneven layers will result in thin spots occurring on the finished project. .Add hot soapy water to the fibers using the squeeze or spray bottle. 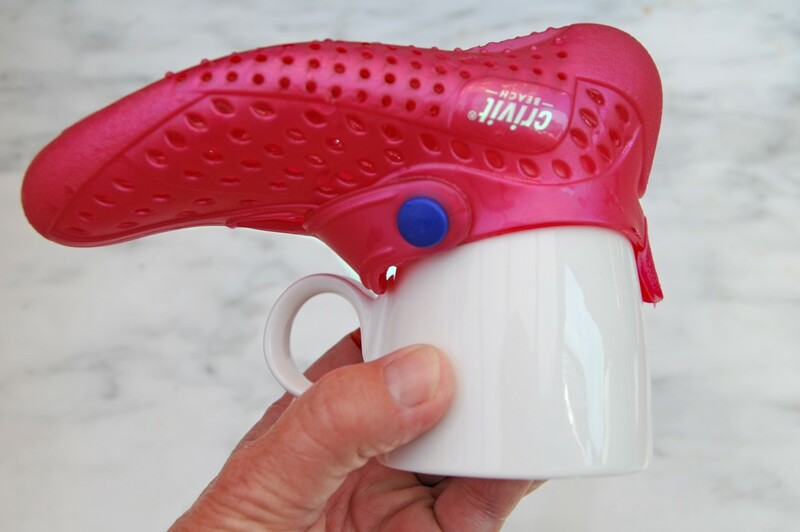 Press the fibers down onto the shoe with your fingers or use a piece of bubble wrap to do this with. .Work carefully to ensure that each shoe is covered in an even layer of even fibers. This is of paramount importance. Massage each completed layer of fiber with your hands or use a piece of folded bubble wrap. Place one hand into the shoe and then use the other to massage the fibers. Do this gently at first as you don't want the fibers to mat together properly until you have completed all three layers of the slipper. Repeat layer one, alternating the direction in which place the fibers down onto the shoe. Always try to ensure that the layers are kept as even as is possible. Add additional fibers to any areas which have thin spots. A note on the use of scissors! As you build up the layers on the slippers, try to ensure that you keep the upper edges of the shoe where the foot goes in neat and straight. Maintain a neat clean straight edge. The idea is to make sure you cover the shoe entirely without ever having to resort to using a pair of scissors to neaten up your edges.. It would be true to say that there are times when scissors can be used whilst felting, but this should always be considered only as a last resort. The use of scissors always results in additional work in order to achieve a good final result. In the image below you can see that the edges are neat and tidy. Add only sufficient wool to maintain a neat edge without having to fold the edges over too far. Continue working around the shoes, keep the layers even and wet them down carefully with your fingers. Put your hand into the shoe and massage the wool gently. 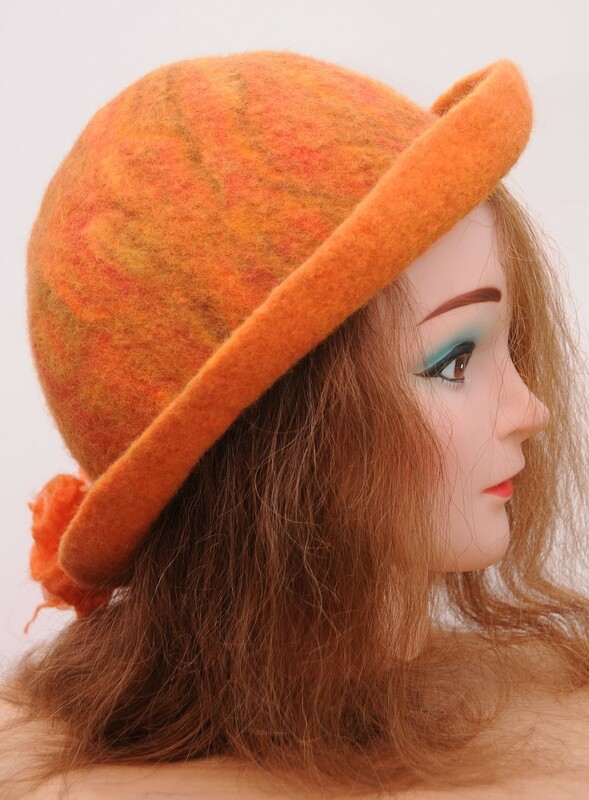 You may find it easier to rub the layers with a folded piece of bubble-wrap which will glide over the wet wool, but the bubbles will create friction which helps with the felting process. Continue wetting and smoothing until you are perfectly satisfied with the second layer. Add additional wool should you find any thin spots. Once satisfied begin the third layer. .Begin adding fibers to the final layer. Once again ensure that you maintain very even layers. Fill any thin spots with additional fibers. Wet with hot soapy water and massage with the bubble wrap. If you feel your layers are too thin, add a fourth layer. If you require any decoration, add this to the final layer or alternatively, you could add your decorative layer to the shoe before you start the first layer. Once the project has been completed the slipper can then be turned inside out to reveal the decoration. Working in reverse can often produce a very good finish. You may decide to felt in a more traditional way which is to do it all by hand. If so, continue rubbing each slipper until the fibers knit together (fulled) under your fingers. Once you are perfectly satisfied, plunge the project first into very hot water and then cold. Repeat this a few times. Remove any excess water carefully with a towel and take the project outside... Put your hands into the shoes and begin hitting them one against the other. You will see and feel the fibers begin to harden beneath your fingers. 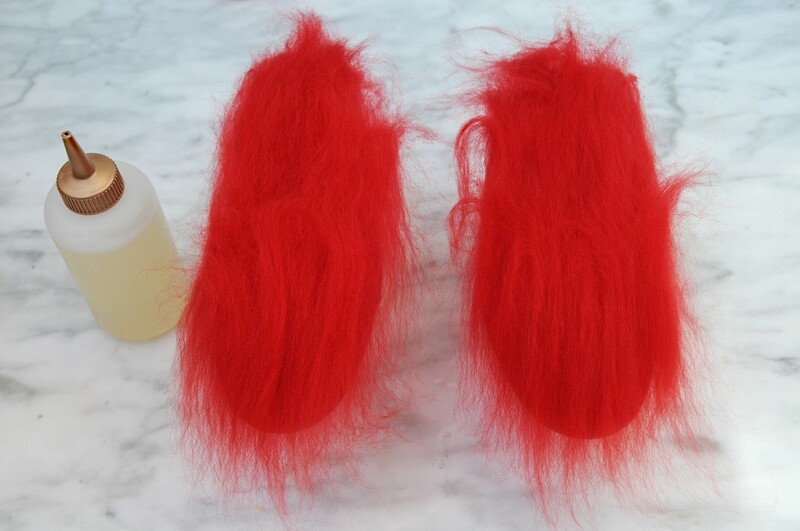 Once the Fulling process has been completed, rinse the slippers until the water runs clear. Remove the beach shoes and rinse again. Squeeze out any excess water and continue to hit the it slippers against the sink draining board until it is completely Fulled. Rinse and shape the slippers with your fingers. Place them in a warm spot such as on a radiator or a cake rack to dry. 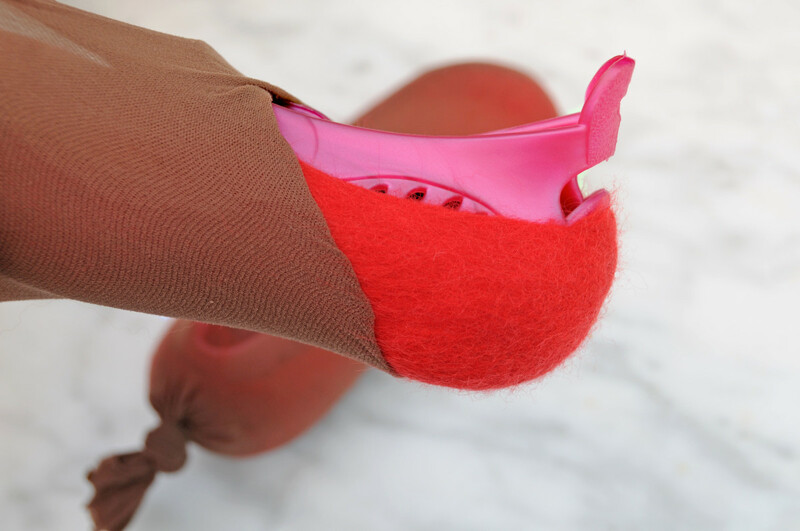 Placing them on these items will allow the air to circulate around the slippers..
Alternatively you may wish to rub the slippers for a little while and when the fibers are sufficiently stable enough to allow the shoes and slippers to be inserted into a pair of cutoff pantyhose without them falling apart you can knot the ends of the pantyhose and insert the whole of the project into the tumble dryer for five to ten minutes. The tumble dryer will agitate the wool and help speed up the felting process. Keep on checking the progress by opening up the tights. This is a good method, well suited for those times when you have to work with several children at a time. Younger children especially only have a short attention span and the felting really does work very quickly using this method. Peel the stocking from the wool. 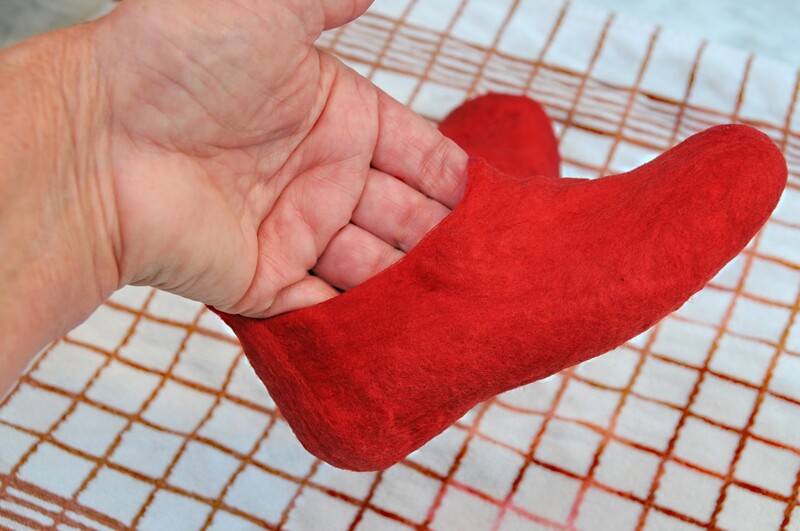 Use of a tumble dryer during the felting project can result in a firmer textured felt. This makes this method a good one for producing slippers which will need to be hard wearing. 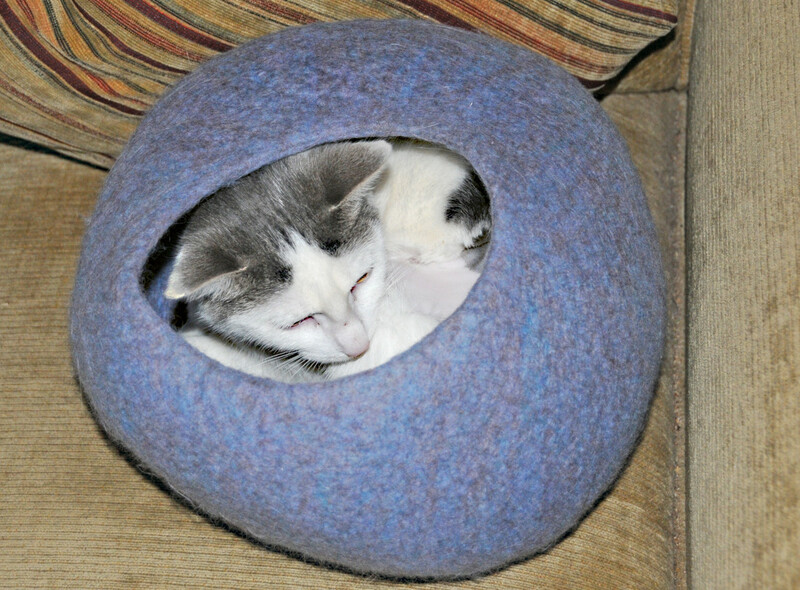 Perhaps one does have less control on the overall felting process when doing it this way but It does suit the purpose. 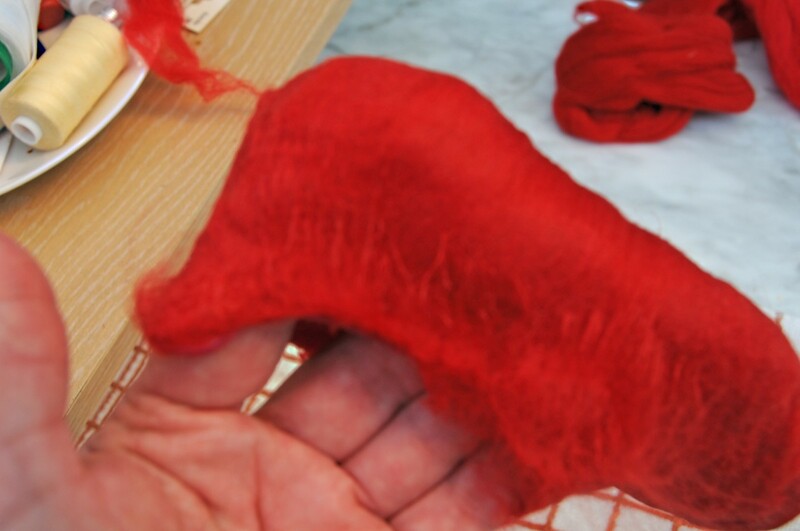 Hand rubbing tends to produce a much softer textured felt, preferable to making scarves and flowers. The stockings are easy be removed from the wool but keep an eye out to ensure that the fibers don't attach themselves too firmly to the pantyhose. Keep checking the wool every few minutes to ensure this does not happen. Gentle tugging will always achieve the desired result. The stockings are easily removed from the wool fibers but keep an eye out to make sure that the fibers don't attach themselves too firmly to the pantyhose. Keep checking the project in the dryer every few minutes.. It should be noted here that shrinkage in the slipper was minimal. Keep in mind that should the slipper shrink more than is desired, this can be remedied by removing the shoe from the slipper and by plunging the slipper into very hot water. This relaxes the wool. Thereafter, stretch the slipper out again. Armed with this knowledge you should feel more relaxed about your ability to achieve a good result. This project right is really very easy. 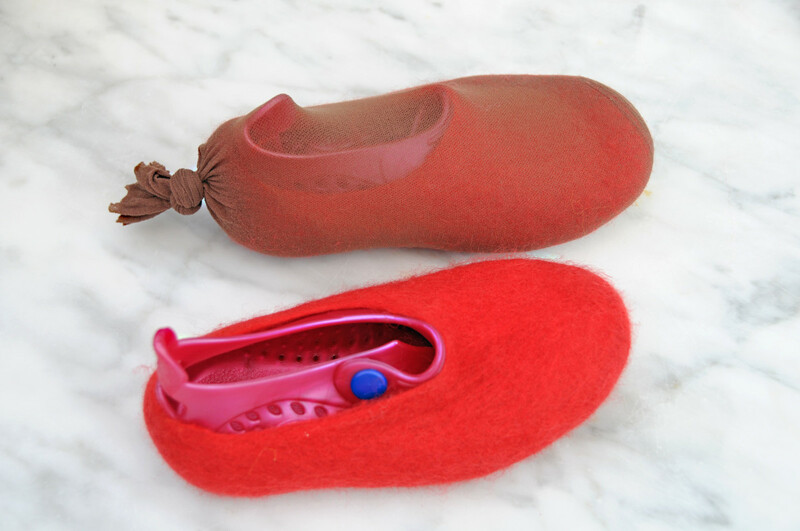 As can be seen in image below, the slipper has shrunk very little but should you want to shrink it further, put it back into the dryer with the shoe still inside and tumble it for a little longer. Want to stretch it a little, dampen it and then stretch it to fit the wearer. It is however far easier to shrink the wool than it is to stretch it. Caution and care are always needed to prevent mishaps from happening. There are many ways to change the look of your slippers. Try adding a few silk fibers to make them shine. Add a little crochet, silk or fabric to add interest and texture. Good with crochet! 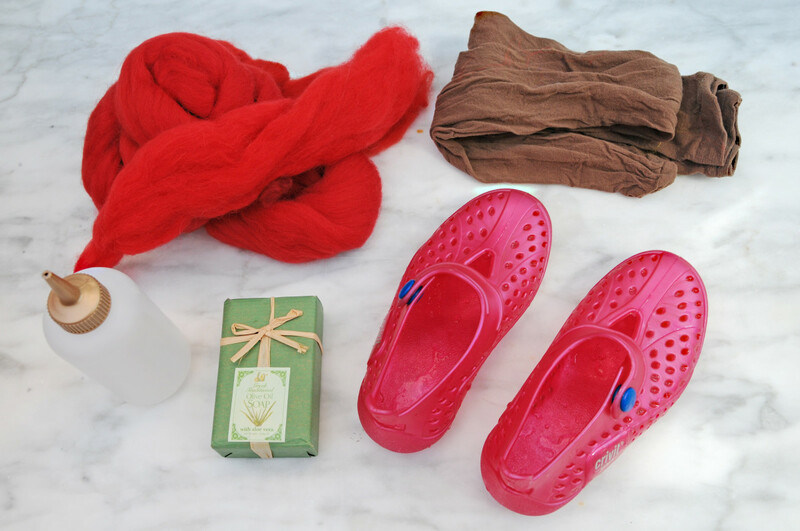 Try adding a little crochet and elastic roll top to your slippers! Embroider with wool or incorporate lace tatting or silk into the surface of your layers. Add textures by mixing fibers which will fuse into the surface of the wool and sometimes even make it stronger. Remember that natural fibers work best. Sew on small leather soles to help prevent children from slipping on smooth wooden floors. Creativity is yours to do what you feel will make your project unique to you as an individual.. It is my hope that this tutorial will encourage new felt makers to take up this amazing craft... Please feel free to comment or ask any questions. . I will do my best to answer any queries you may have regarding any part of this project. How likely are you to try this project? 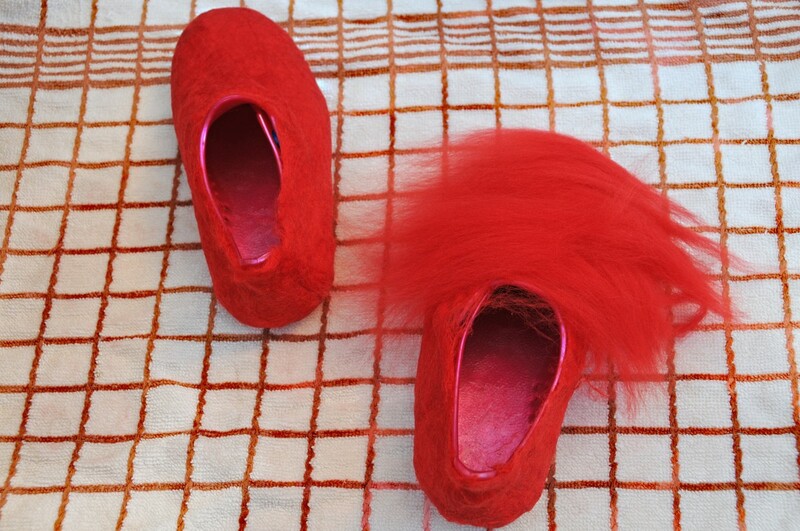 About how much do you estimate these wet-felted slippers cost to make? The cost of making these slippers will be very little. I suggest buying 500grams of Roving / Top Waste - Botany Lap Waste - Wool Ends - Felting - Spinning wool from World of Wool for all your projects. I sometimes purchase it from Amazon if I have been fortunate enough to have been given a gift voucher. The cost will be in the region of £14 plus postage. 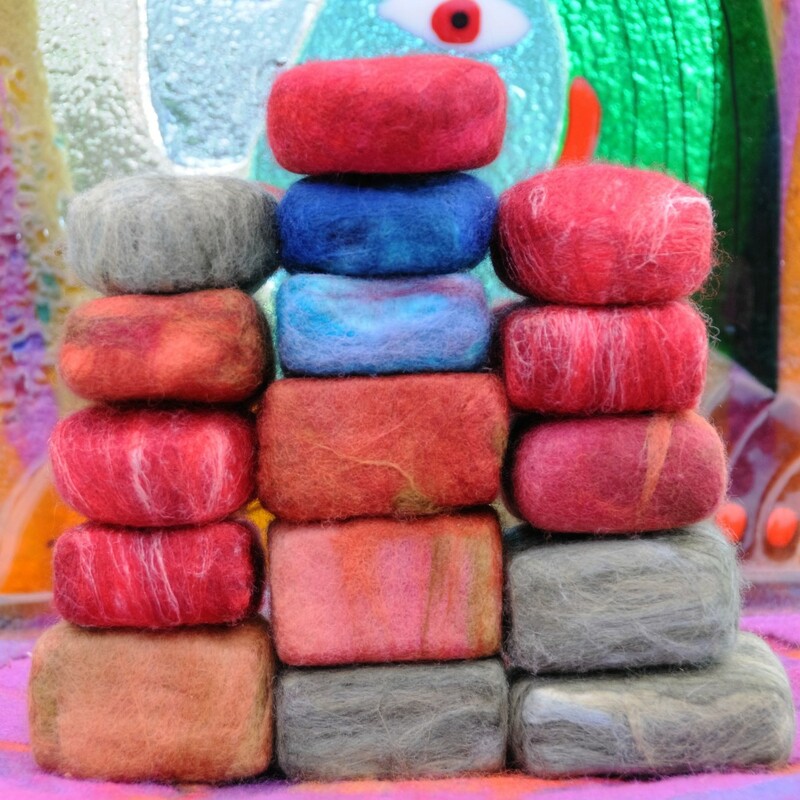 You will receive a lucky dip of colors all of which will be very useful for all of your felting projects, big or small. I find this to be incredible value for money. The little red shoes were bought for very little from a local car boot for about £1. 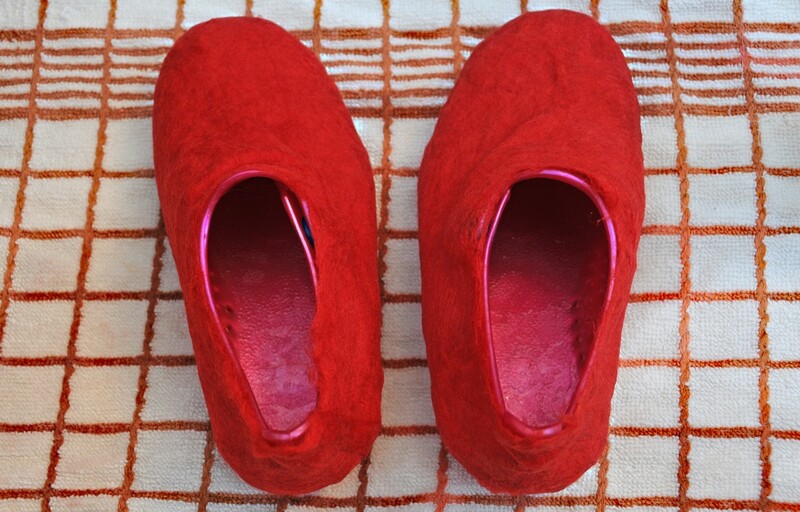 Can rubber shoes without holes be substituted to make wet-felted slippers? You have several options, plastic or rubber shoes without heels can be substituted as long as they are bendy enough to be easily removed from the slippers. Tiny beach shoes might be an option. You could use polystyrene shoe lasts, metal or wooden shoe Lasts as well. 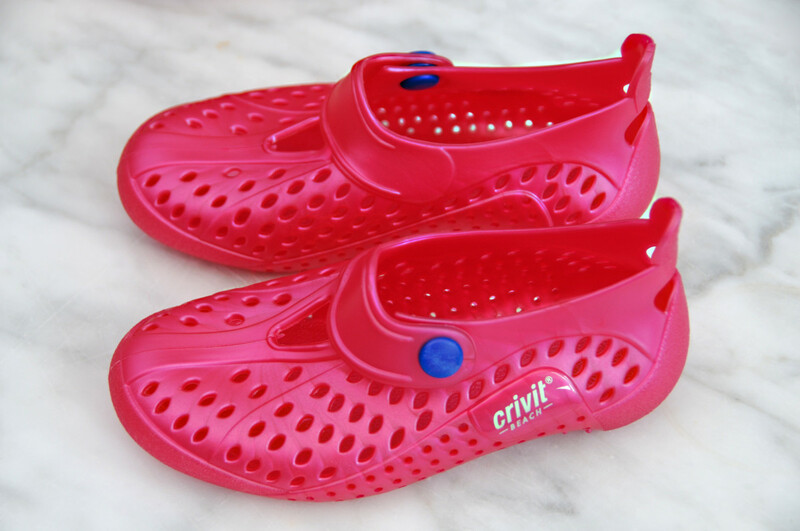 You could even try fitting them on a child when they are still wet. 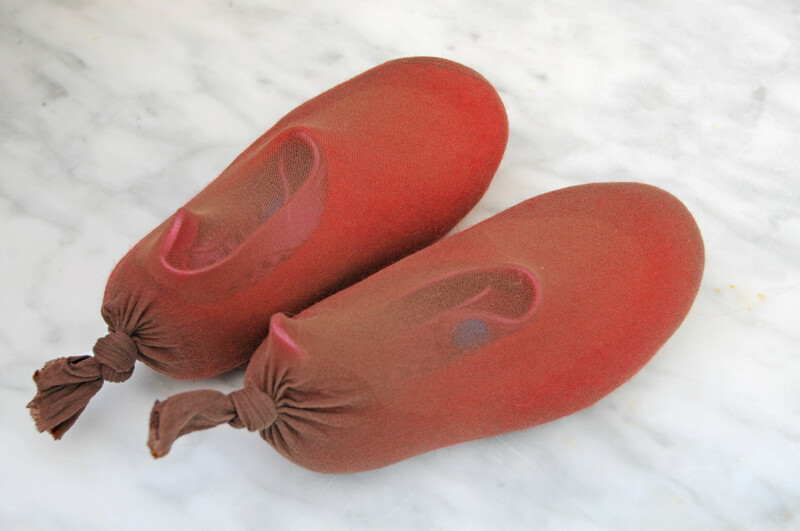 Shape them on the feet by rubbing the wet felt with a folded piece of bubble wrap and when shaped you can stuff the little slippers with a little paper, plastic bags or bubble wrap while they are drying. 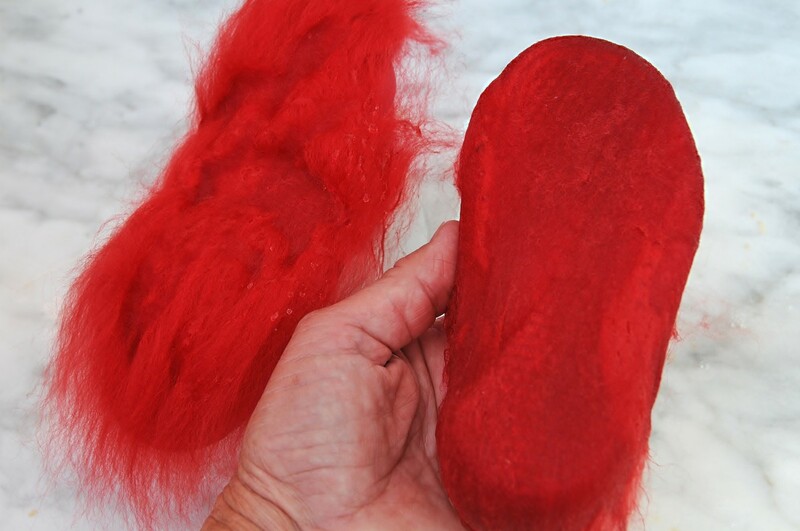 If using the dryer method to make wet-felted slippers, at what point do you rinse out the soap? Before the dryer or after? Will the wool slippers feel itchy on the feet? It really depends on the type of wool you use. I use Merino Wool Roving, which is soft to the touch. Would the instructions in your article be okay to make large men's slippers as well? I saw your other article with water shoes for adults. However, the shape is different. I prefer the method of using a template for making adult slippers, but there is no reason why you cannot use plastic shoes, water shoes or even your own feet or polystyrene lasts for shaping the slippers on. There are no hard and fast rules when it comes to wet felting. Try experimenting with the different methods to see which one you enjoy working with. Julieta, the easiest way is to wet them and put them into the tumble dryer for a while. Keep on checking them regularly so they don't shink too far. It could take a little while depending on how big they are. Once they are almost the right size, wet them again and put them on your Husband's feet to shape them to his size or the size of your last. Hi, thanks a lot for the tutorial. I made a pair of slippers for my husband but they are way too big. How can I make them shrink? I'd appreciate so much if you could help me! Kathleen, without being able to see them it sounds as if they were insufficiently felted. I would suggest that you wet them again with hot soapy water and try felting them again. To make it easier you could put them on your own feet to do this or put them onto a pair of shoe lasts. You could also try needle felting the loose wool. I would comb or brush some of the pieces of wool out using hand carders or small dog brushes and then lay those fibres out in a small square. 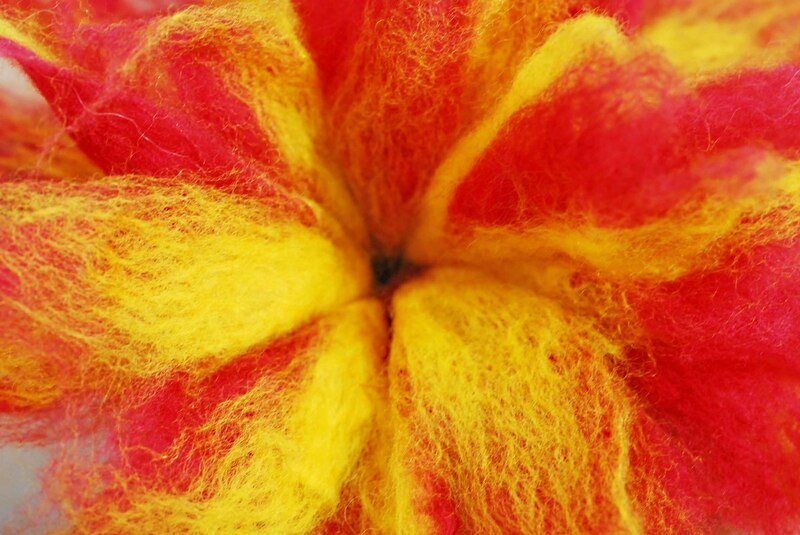 Do an experimental piece of felting with the wool. Rub with hot soapy water until the fibres felt (if they do and they should) it is definitely worth a try. I have been using a lot of raw wool lately as it makes felting so much more cost effective. You can always add decorative fibres to the surface if you life. You should get lots of pairs of slippers out of the rug. Please look at some of my other tutorials for different ways of making slippers or boots. 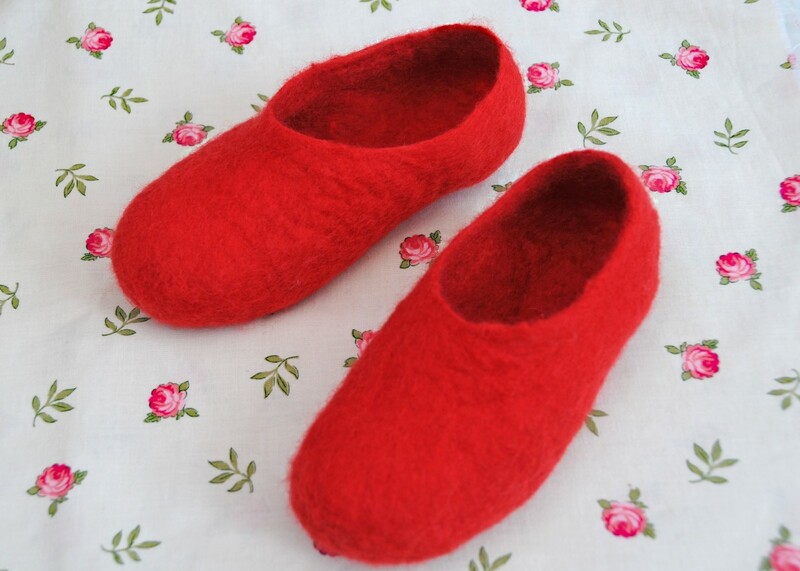 I read the whole tutorial with great interest and I'm anxious to try making some felted slippers. My question is this: I have a large dark brown sheepskin with rather long fur which a canine friend decided to chew apart. It's in hundreds of pieces and can no longer be used as a rug. I never threw it out, and now I know why! Do you think I could use these wool fibers to make wet felted slippers? The wool is not as soft as your photos, but it's available! It very much depends on how many layers you use but I would estimate about 8oz per slipper as the layers should be thicker for an adult. I would order more than you need the first time. 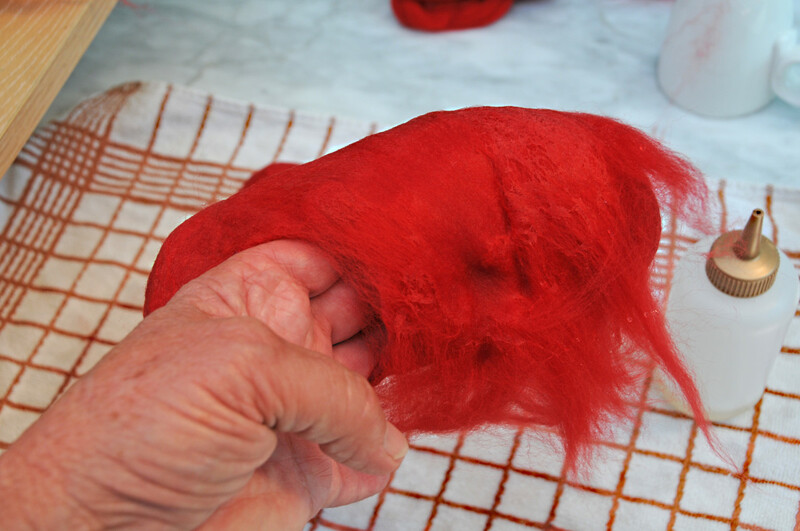 It is always better to be safe than sorry when you first start out felting. What you have left over can always be mixed with other colors for different projects. These look great! I am going to try making some felt slippers for the first time and this tutorial is very helpful. Roughly how much wool roving will I need to make slippers for an adult? Thanks! You will find it easier to rub the layers with a folded piece of bubble-wrap which will not only glide over the wet wool, but the bubbles will help create friction which helps with the felting process. Don't forget to check out some of my other boots Tutorials, in particular the little boots which I made with the same pair of shoes that I used in this Tutorial. So nice to receive such positive feedback. I appreciate your stopping by to comment. Thank you. Wonderful tutorial. Working on making some felted boots (pinky swore to a friend that I would), and this has been the best tutorial yet!. Can you please tell me what the purpose of the bubble wrap is? Thank you! Sounds good, might be a good idea to buy them larger than you need for yourself, especially for an adult size slipper. Allow for shrinkage which can be around 30% to be on the safe size. You can always shrink felt but it is impossible to stretch it. It they come out too large put the slippers in the tumble dryer for a while or alternatively, apply soap and warm water and lots of friction by rubbing the wool with your hands. The more rub the more the wool will shrink, down to the size you want. These shoes are being sold in a store for P550 each. I'll try making my own just for fun. Glad you liked the tutorial. I have not tried Corriedale but will definitely look out for some on e-Bay. Thanks for the visit and the comment, it is valued and appreciated. 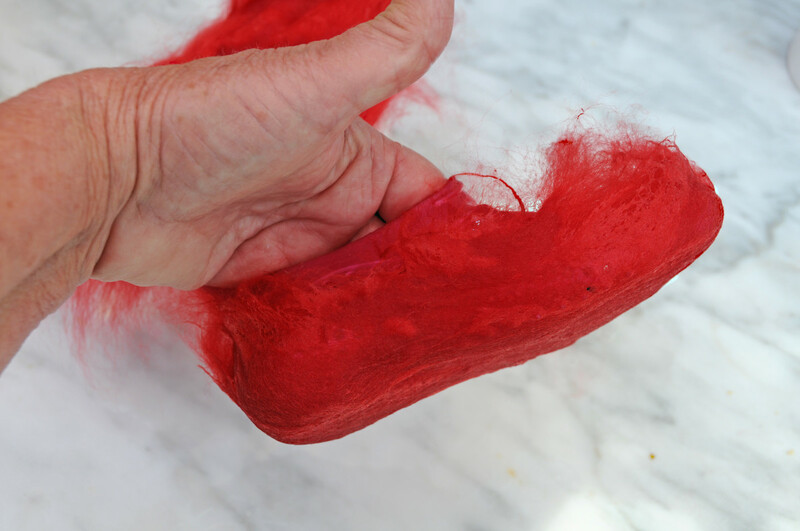 Great tutorial on wet felting slippers. 100% wool Corriedale roving would also be good for the slippers. This can be found on etsy 0r eBay. Corriedale might be a bit stronger wool too. 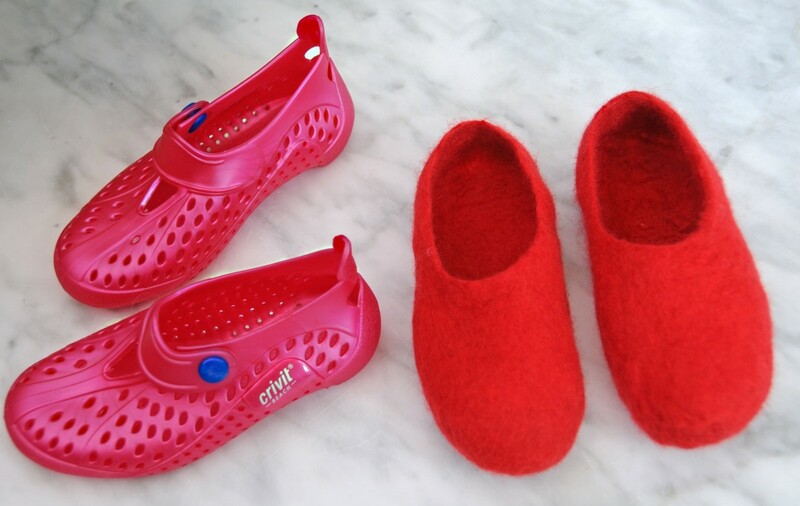 Line the felted slippers or the beach shoes? I have not lined the slippers and don't really see the need as one can always wear a pair of socks when wearing the slippers. The thrift store is a great place to start, or you can make duct tape shoe lasts or use resin or wood shoe lasts. The next best would be to use the template method, make the slippers flat and use one of the alternatives, wooden, duct tape or beach shoes to shape them on.. I very much appreciate the share, thank you. What a novel idea. I'd love to make them for friends. Guess I'll have to get a supply beach shoes in different sizes. Perhaps the thrift stores? Is it possible to line them? Sharing. Glad to hear that you found the instructions to be clear on how to make the wet felted slippers. I am sure you could pull of a pair - the perfect Christmas present. Thanks for the vote up and the share, it is much appreciated. These slippers are adorable, and you have provided such clear instructions that I am quite sure that even I could pull off a pair, perhaps for the granddaughters for Christmas! Voted up and shared! I appreciate your taking the time to comment Jodah. I especially appreciate your sharing the instructions with your wife. I look forward to hearing how she gets on. Thanks too for the vote up. Terrific hub with clear step by step instructions Sallybea. My wife thinks these slippers are great and she is very crafty so I think she will give them a go. Voted up. That sounds like a great idea - I wonder if you saw the little mice slipper tutorial I published last week? Another cute idea and one which turned out very well. One of my little friends was really enchanted by them and wanted to know how he could make some. Bless his little cotton socks, he is only six but already well into crafts. What a cute little project! I think they would make great Santa shoes for kids with some white buttons and that curvy ribbon on them. Well done on showing every step of the technique - I admire your patience in photographing it properly so that people can follow it easier. Voted useful and up! I appreciate your stopping by and very much appreciate the very kind comment, thank you very much. Your layout and content covering this craft is very nice and well done. I would love to have a pair of these any day. I hope you wife enjoys the tutorial. I appreciate your taking the time and the interest to show you her this one. Please ask her to check my pages for many more tutorials on the same subject. 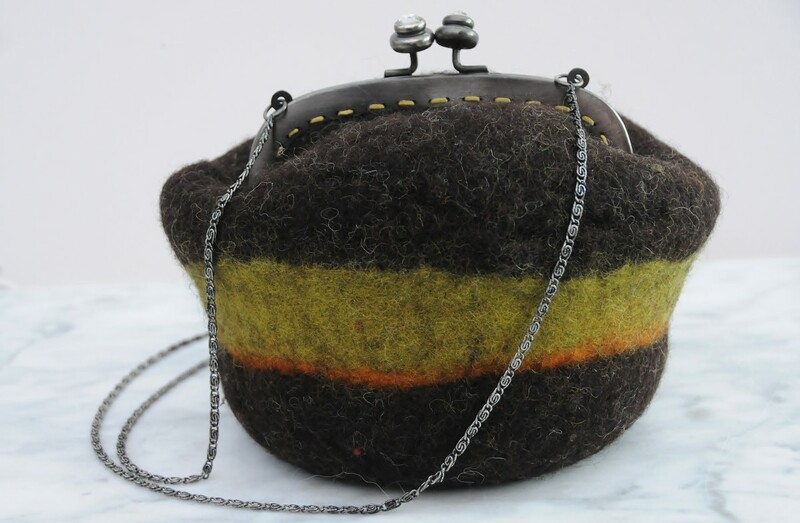 Will show this to my wife she's into felting and would love this. DDE - Good to hear that you are doing well, you have a great week too. Hi Sally I am doing well and I admire your creative ideas shared with us. Have a great week. A roving is a long and narrow piece of cleaned and more often than not dyed strip of wool fibers, They are soft and beautiful to touch. Rovings are produced during the process of making spun yarn from wool fleece, raw cotton or other fibers. 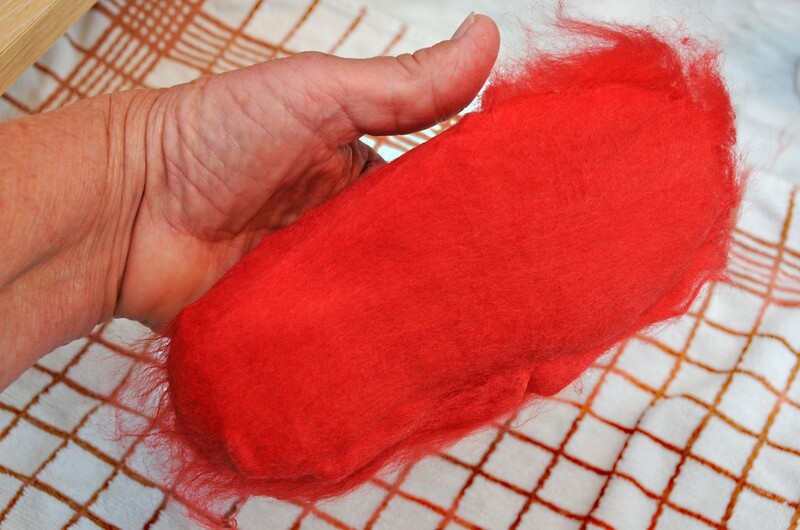 Their main use is in spinning but it can also be used for specialized arts such as the one above - namely 'Wet felting'. You will find an amazon advert above which will take you to Amazon where further examples of merino wool roving suitable for wet felting can be purchased. I sometimes purchase from e-Bay but more often than not, I buy from a specialized shop here in the UK over the internet. 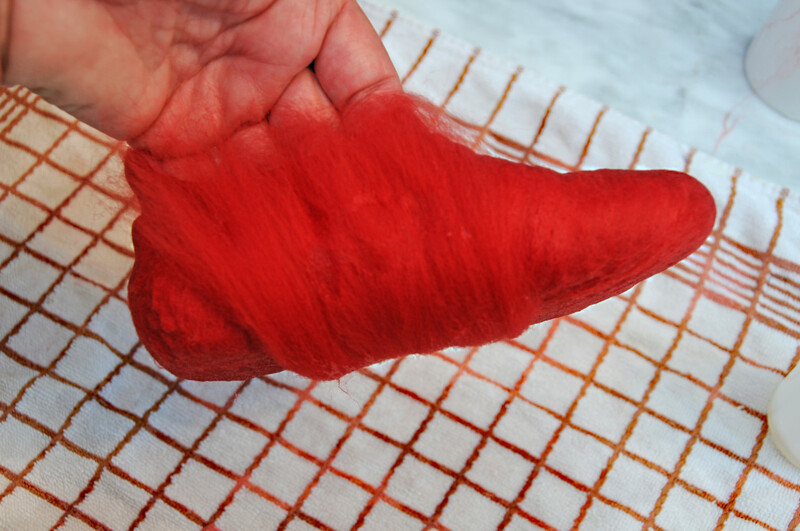 I would suggest that you Google Merino Wool roving, or 'tops' - make sure that the ad states that it is suitable for wet felting and I think you will find as I did that it can be purchased in Texas. 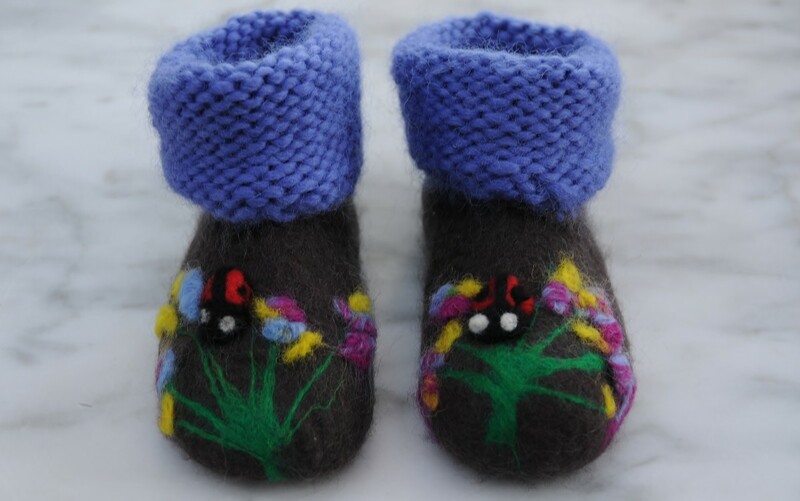 When starting out, I would buy sufficient to do a few small projects such as booties, slippers, a hat or similar. You will find more simple wet felting tutorials on my profile page. I would suggest that you buy a bundle of mixed bright colors if you can. This will give you lots of choice for future projects. Combine the complementary colors they provide and you shouldl be delighted with the effect. Thank you for your question and also your interest. I will be delighted to know how you get on. I am always delighted to have your stop my MsDora - your comments and thoughts are always appreciated. You have a lovely day. I love this! The only thing I'd like to know is what is wool roving? I've never heard of it. I've tried regular felting and it didn't work because the yarn I used wasn't 100% wool which is very hard to find here for some reason. Maybe I could find it online. This is a well done hub - the instructions are very well done. I might try it if I can find the stuff I need. Thanks for sharing! Sally, it is unlikely that I will try this, but I admire your passion for this craft. I read through the instructions completely. 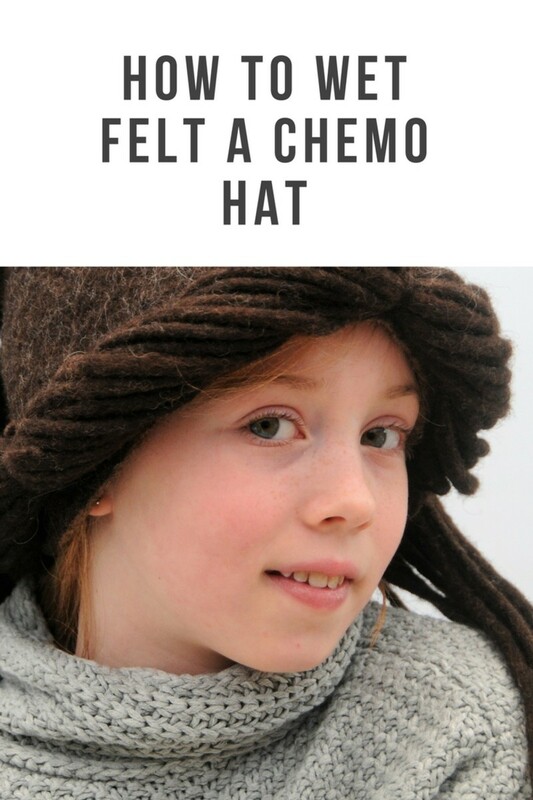 Another creative project which I'm sure wet felters will be proud to accomplish. Thanks for sharing. Great to hear from you again. It makes me realize how much I have missed both felting and writing. I shall look forward to reading more of your hubs soon. So pleased to hear that you find the process of wet felting fascinating - time to give it a go then - perhaps! Thank you for the great comments, also the vote up, tweet and pin. I hope your week-end is a terrific one. So great to see you publishing this day! I have been so busy this summer here too and have not published anything in far too long. I hope to remedy that soon. I am always fascinated at this process and then the end results! I do not know if I could do so well as you have here, but your instructions and photos are clear and of great help to anyone who would like to try to project. Yes, it has been quite a while. I hope you are doing well in your neck of the woods and I much appreciate your continued support as always. I have been experimenting with a few new ideas and hope to write more about those soon. Thank you for the vote up and interesting and useful. Hi Sally it has been a while and you always come back with a creative idea. I really like the way you explained and the photos are most informative. Most likely I would try this project. Voted up, interesting and useful. Thank you so much Billy. I am always grateful for your continued support. I am afraid I have been much more busy than usual and the weather has kept outdoors for much of the time. Come winter, I will be making up for my tardiness. I hope you are having a wonderful weekend too. It's good to see you writing again. Although this has nothing to do with me, I do enjoy seeing you write about something you obviously know a great deal about. This is a perfect example of how to write a craft article...well done, Sally.